The Crystal River Boat Builders is a non-profit educational organization which works to preserve and continue the maritime heritage of the Nature Coast of Florida. First begun in 2009, they were originally hosted by Crystal River Preserve State Park. They now have their own building along U.S. Highway 19 in Crystal River that they operate as a museum and boat building shop. Staffed completely by volunteers, the organization builds replicas of historic boats used along the Gulf Coast ... using traditional methods and hand tools. Originally started as an educational project, the founding sponsor of the group was the office of Florida Public Archaeology Network. To date, the group has constructed many different types of boats that were used for fishing and commerce during the 1800's and early 1900's. One of the best examples of their work is the sailing scow "Spirit" - a reproduction of a Civil War era sailing scow that was used as a blockade runner. 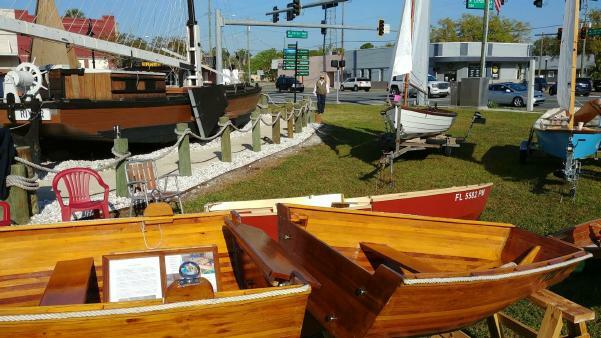 The boat was launched in 2013 and actively sailed for a couple of years before being retired to a permanent land-based exhibit at the corner of U.S. 19 and Citrus Avenue. Crystal River Boat Builders is a "working" museum where visitors can come and watch as craftsman ply their boat building trade, and learn about the skills and tools that were used. They are open to the public for limited hours on certain days of the week. Be sure to check the Facebook page link below before you visit to make sure they will be open when you go. Schools or other groups may call ahead for reservations.